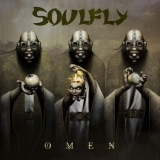 SOULFLY - OMEN (CD) | Online Shop | Wizard LTD.
SOULFLY will release its seventh album, "Omen", on May 25 via Roadrunner Records. "Rise Of The Fallen" is available for free download. The track features a guest appearance by Greg Puciato of THE DILLINGER ESCAPE PLAN. "Omen" was recorded at Edge Of The Earth studios in Hollywood, California with co-producer Logan Mader (MACHINE HEAD, DIVINE HERESY, CAVALERA CONSPIRACY, GOJIRA, DEVILDRIVER) and it features guest appearances by THE DILLINGER ESCAPE PLAN frontman Greg Puciato and PRONG mainman Tommy Victor. Of the collaborations, guitarist/vocalist Max Cavalera says, "The first one is a song with Tommy Victor from PRONG sharing vocals on a song called 'Lethal Injection'. The other is 'Rise Of The Fallen', with shared vocals from Greg Puciato, THE DILLINGER ESCAPE PLAN's singer. I also recorded two B-sides with both of my sons playing drums. Igor Cavalera plays on EXCEL's 'Your Life, My Life', and Zyon Cavalera plays on SEPULTURA's 'Refuse/Resist' cover." SOULFLY filmed a video for the song "Rise Of The Fallen" during the band's March 17, 2010 live performance at the Chance Theater in Poughkeepsie, New York. Directing the clip was Dale "Rage" Resteghini, who has helmed over 550 music videos since 2003, including clips for such metal bands as MUDVAYNE, HATEBREED, ANTHRAX, and SHADOWS FALL. Rage has also directed videos for some of the biggest names in the hip hop world, including Lil Wayne, Diddy, Snoop Dog, and Ice Cube.